Hiragana seisuiki was originally written by three authors for the puppet theater and was composed of five acts. Only two survive today and are still being performed. Its first staging was in 1739, approximately 100 years before the production of this print. The play is loosely based on the 12th century rivalry between the Genji and Heike clans. Mirroring the struggle between the two clans there is a rivalry between the brothers of one family which forms the focus of this act, the Genta kando. Genta, the dashing, handsome brother is off fighting the enemy while his evil, conniving younger brother Heiji stays at home plotting to usurp his brother's position. The beautiful Chidori plays the love interest. She loves Genta, while his brother Heiji lusts after her. Things have not gone well in battle - or, at least, not according to plan - and Genta is ordered to return home to commit suicide. Genta sees his mother, Chidori and his younger brother. All is high drama with many twists and turns in the story. Enju, the mother, tries to convince her son not to kill himself. He says he must. In desperation she has his swords, armour and elegant clothes taken from him and replaced by those of an old servant. Heiji mocks his brother, Enju pretends to mock him too. This shame is greater than the original one and Genta weeps as his mother orders her disgraced son to go back to the battle and to earn his respect back. Chidori scold Enju for what she believes is the mother's cruelty. Heiji grabs Chidori and says that now she is his. Chidori rebukes his advances so Heiji tells his mother that Chidori was Genta's lover and that she has shamed their household. More drama. Eventually Genta, with his recovered armor, and Chidori leave for the front together with the subtle blessing and help of Enju. 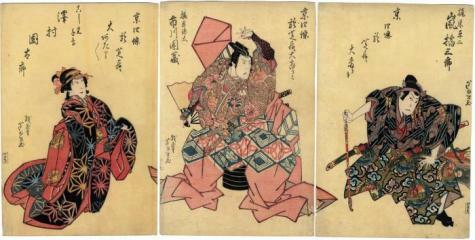 This triptych commemorates a performance at the Kita Theater on 7/1827.